A 5K run/walk, 1M walk and kid’s event. Participants are encouraged to draw attention to their bottoms and colorectal cancer by participating in their boxers. Rollin' to Colon is a bicycle ride event for adults and kids alike. Several routes have been mapped, including a 53 mile loop to Colon, Nebraska. A 20 minute competition of burpees to honor the memory of Rhonda VanBeek, the mother of Justin VanBeek, owner and head coach of CrossFit Hydro Gym. 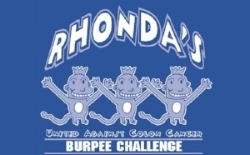 Rolanda is a 20-foot long, 12-foot wide and 10-foot high Inflatable Colon. Visitors can walk through the inflatable colon to get a close-up look at healthy colon tissues, tissue with non-malignant colorectal diseases, and tissue with various stages of colorectal cancer. All signs are in English and Spanish. Rolanda is a regular at our Rollin’ to Colon and Boxer 500 events, and would love to come visit your special event to help promote colon cancer screening. In 2014, Rolanda visited 10 different locations through the state of Nebraska helping communities get out the word about the importance of scheduling regular colon screenings. We are always looking for volunteers to help with our events and contribute to our cause. If you are interested in making a contribution to sponsor one of our events or programs, please get in touch. The Task Force meets the first Thursday of the month at 7:00 a.m. at the American Cancer Society, 9850 Nicholas Street, Suite 200, Omaha. All are welcome to attend. For more information or to be added to our meeting list, contact us below. The Colon Cancer Support Group meets on the third Thursday of each month at the American Cancer Society (9850 Nicholas St, Omaha, NE 68114) from 5:30-7:30 pm. To learn more or register, click below or call 402.393.5801.